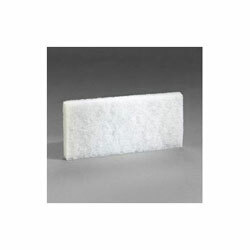 3M 8440 Doodlebug White 4.5" x 10" cleansing pad designed for delicate surfaces and light cleaning jobs. Use with No.6473 Doodlebug Hand Block or No.6472 Doodlebug Pad Holder. 3M White Scrub Pads for Doodlebug Cleaning System. Use with 3M.6473 Doodlebug Hand Block or 3M 6472 Doodlebug Pad Holder. Designed for delicate surfaces and light cleaning jobs.